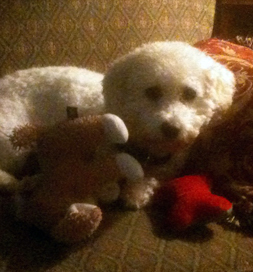 Waverly, a purebred Bichon Frisé, was abandoned by her people, left in a house alone and without food. Her hair was matted and dirty. When she was found, Animal Alliance, a rescue group in Lambertville, NJ, took her in and posted her photo on Petfinder. Randall Wilson saw her listing. The Newtown, PA, man had lost his 14-year-old dog, Angel, to illness and was feeling lost without her. When he saw Waverly, he arranged to meet her. Amy settles in a favorite spot with her toys. Upon arriving at the home where she was being cared for, Randall didn’t recognize her. She’d been shaved to remove the mats from her coat. She was also rather nervous. He must have seemed a little unsure because the rescue person suggested he take Waverly home for a trial period. Randall says Amy has an inner light and can express her feelings with her eyes. At times, she has “bursts of joy,” a joy that must surely come from sensing that this home with Randall is truly forever.